Today Matt Hirsch, our next door neighbor, installed the Little Free Museum on Mifflin Street. The grand opening is Saturday, July 11, 3 p.m. on the 1900 block of E. Mifflin St., between 1st and 2nd streets. 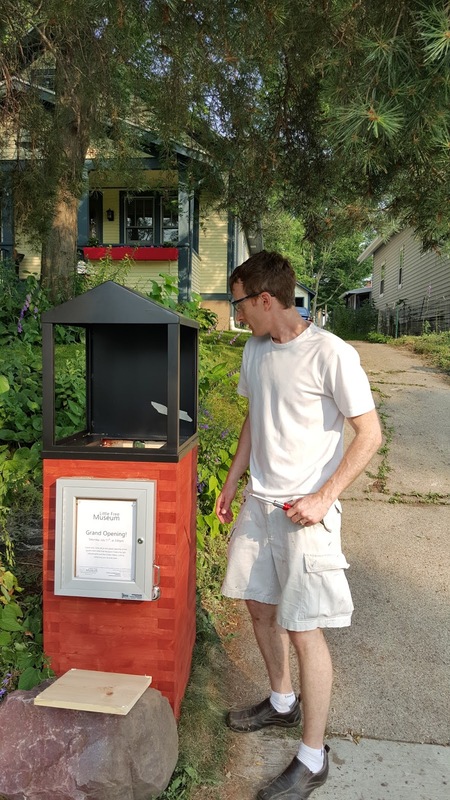 While talking with Matt, we looked down our street and saw the Little Free Gallery, a Little Free Library (charter 2805) and our own Little Orchard on Mifflin. Taking all this in and noting the "little" theme, Matt suggested we call our block "Little Mifflin Street." Jay, Matt and I all had the same thing in mind, one of those decorative arches like you see at the entrance to every Chinatown in America that says "Welcome to Little Mifflin." While we won't have the grand entrance in place just yet, please come to the Little Free Museum's grand opening, which will host refreshments and the "tiniest ribbon cutting you'll ever see!"